Dave Ramsey is a leader in the personal finance improvement field. The reason he is because he has a simple to follow framework that is easy for everyone to understand and the method is effective. Not everyone is in the same financial situation or has the same aptitude because we are not all clones. In each step I’d like to see if there are ways to use different strategies to enhance the step. Pay ahead using the snowball method; smallest to largest until you are one month ahead on every bill. This provides you with a great advantage. After you are ahead one month with all bills, future bills can then be paid any time in the month that you choose – on your schedule not the company who is billing you. Build up your emergency fund based upon your estimated time to get re-employed if you had to look for a job. The rule of thumb is usually one month for every $10,000 of annual income. Of course the more expenses, the more money it would take to fill the fund. (Expenses usually increase with income for most people.) If you are the sole supporter or the main bread winner of your family the emergency fund should be larger because if your job is lost all or most of the family’s income is gone. Nine months should be the minimum in such cases. Dave Ramsey’s recommended action is to invest 15% into a 401(k), IRA, Roth IRA or other traditional retirement vehicle. Why does it have to be in one of those retirement vehicles? Why is 15% the limit? If a retirement fund doesn’t get released without a penalty until you are in your 60s or 70s What happens if you want to retire early? These are the questions I ask myself when I look at this step. The first thing I look at is the company match on the 401k if available; don’t leave money on the table. Then look for more interesting ways to invest. I use the S&P 500 fund for my yardstick. (the average return that I see reported is between 8-12%; I split the difference and say 10%) In the 401k I’d put the S&P 500 fund based upon John Bogle‘s findings. Once the company match is made I can look for other vehicles. The vehicle may not be the obvious and may change based upon what plans I have. I may buy an index fund outside of the retirement plan or if I feel stocks are overpriced a extra payment can be made to the principal of a mortgage buying back interest and time. (This is a jump on the step six.) The dollar per dollar ROI is usually better than 10% on mortgage prepayment. Another option might be to start or enhance a side business. Even different still might be to increase your skill set to become more valuable. Part III coming soon… so much for quickie article. 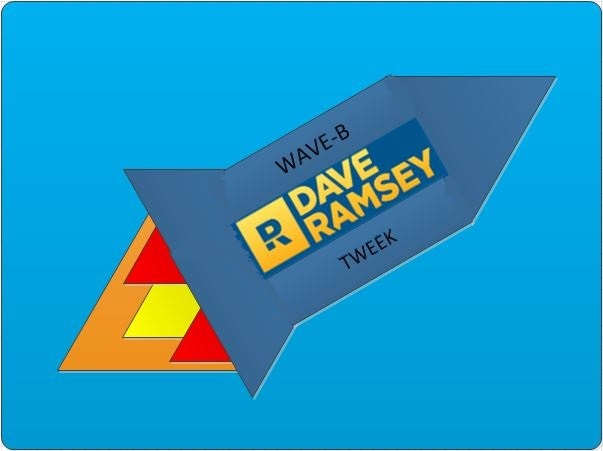 This entry was posted in Added Value, Goal Setting and tagged baby steps, Dave Ramsey, tweek. Bookmark the permalink.